Apple is rumored to be working on a new high-end 2018 iPad Pro that is said to adopt many design elements from the iPhone X including Face ID and the removal of the Home button, and several changes newly discovered in iOS 12 appear to bear out those claims. As reported by MacRumors yesterday, Apple has tweaked iPad gestures in iOS 12 to bring them in line with gestures on iPhone X. For example, swiping up from the dock brings up the Home screen, as it does on iPhone X in lieu of a Home button. Similarly, users now swipe down from the top right of the iPad to bring up Control Center, rather than swiping up from the bottom. This action was originally introduced in tandem with the iPhone X's notch, which houses Apple's advanced face detection sensors and leaves an "ear" on either side of it. Likewise, status bar changes to accommodate a possible notch can now be found in iOS 12's iPad interface – the time, day, and date are located on the upper left hand side of the screen, while the right displays the current Wi-Fi/LTE connection, Bluetooth status, and battery life. Of course, it's possible Apple simply brought over the gestural and menu bar changes to iPad to create interface parity across its iOS lineup, but it's likely Apple is paving the way for redesigned iPads widely believed to be coming later this year. According to a November report by Bloomberg, the next-generation iPad Pro will feature slimmer edges, a faster processor, a custom Apple-built GPU, and a TrueDepth camera with support for Face ID. The new tablet device will reportedly do away with the Home button. 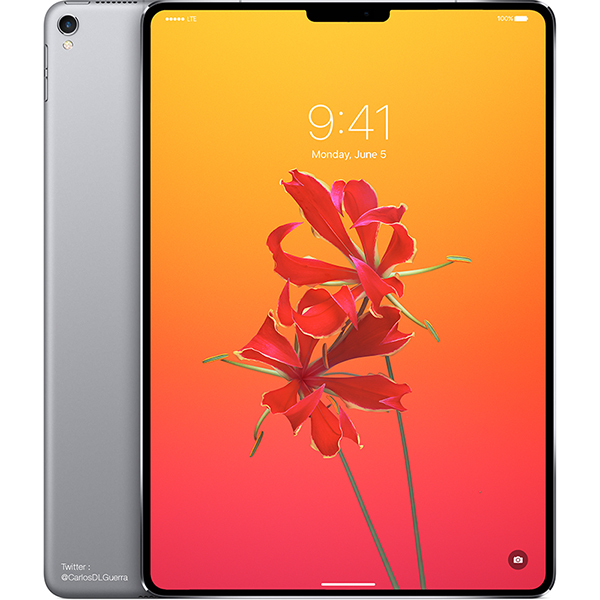 Well-regarded market analyst Ming-Chi Kuo has also stated he believes new iPad Pro models set to be released in 2018 will come equipped with a TrueDepth Camera and will support Face ID. Whether Apple will adopt a notch for the TrueDepth camera and sensors or simply integrate them into the surrounding bezel remains unclear. There was some speculation whether Apple would unveil new hardware during last night's keynote, but that didn't happen, and we're now expecting the next round of iOS devices to appear in the fall. In the meantime, stay tuned to MacRumors for more details on all the announcements at this year's WWDC. That iPad render looks slik! I just don't see a notch happening on iPads. They would leave enough bezel on it to house all cameras and sensors because the bezel does not need to be as minimal as it is on the iPhone X. How do you properly hold a bezel-less iPad? The notch would be a huge distraction on the iPad. Can we please stop calling the top status bar a "menu bar" .... it's not a Mac, there is no menu there. If FaceID is implemented then they need to add the ability to store multiple FaceIDs. What about when your using your iPad in landscape mode which is how I use mine a majority of the time then the notch would be irrelevant to the new gesture. By the way the notch on the phone I don't have a problem with at all but on the iPad it really does look ridiculous. This may be the year I upgrade to a Pro from the Air 2. I need someone to explain why the iPad needs such tiny bezels? The iPhone you are maximizing the screen size of something that is being held in one hand and normally placed in a pocket. Those constraints don’t exist for the iPad so the lack of bezels just becomes something that makes it significantly less durable and probably less useful since holding it will cause your hands to likely cover portions of the screen at all times. I think the iPad would be totally fine with a notch sized bezel around the entire screen, eliminating the need for the notch.